Studio portrait of 5914 Lance Corporal (LCpl), 20th Battalion, of Leichhardt, NSW. Believed to have been born in February 1901, LCpl West enlisted on 13 May 1916 at the age of fourteen years and eight months. He claimed to be eighteen years and one month and his application to enlist claims a document recording his parents’ consent was produced. He embarked on the HMAT Ceramic on 7 October 1916 and fought for eight months in the trenches where he won his promotion to Lance Corporal, aged sixteen. He was wounded on 3 May 1917 and returned to the trenches a week later. On 8 October 1917 he died of wounds in Belgium at the 2nd Canadian Casualty Clearing Station, one month after his sixteenth birthday. 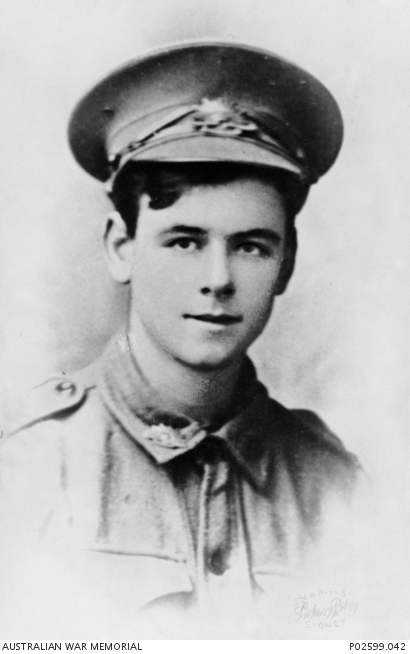 His portrait is one of a number displayed on a photo montage Honour Board made for the department store Anthony Hordern and Sons Ltd, Sydney by the returned soldier and sailor employees of the company. It commemorated 46 of the company’s 48 employees who died as a result of their service in the First World War. Two brothers also served: 116 Company Quarter Master Sergeant (CQMS) Harry Walter West of the 54th Battalion, who landed at Gallipoli, and 4281 Private (Pte) Clifford Sydney West of the 56th Battalion; both survived the war.